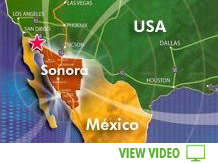 We are a group of companies from various countries including Canada, Germany, Spain, USA and Mexico, which are up and are in a Trust, through which it conducts industrial development project America's largest integrated in one place, with 3,217 acres strategically located at the junction of four states, Arizona U.S. and California, Baja California and Sonora in Mexico. International Industrial Park (PIISL) runs the comprehensive industrial development project that promotes the creation of a properly planned community with all services necessary for the establishment of companies, maquiladoras and manufacturing, housing development, commercial and service areas, right at the entrance of the world's largest market. The Master Plan envisages to have in its final stage with 65,000 homes, 240,000 direct and 350,000 indirect jobs in an estimated period of 20 years. Today there are more than 10,000 jobs in 11 companies in operation. Field Extensive and optimal for building. In northwestern Mexico, U.S. border. Our vision is the creation and integration of a community where industrial, commercial and service development will combine all users within the same area, which promotes prosperity for investors, companies and harmonious development of welfare workers at all levels and their families, raising the living standards of the community, promoting a strong society, dynamic and productive, with high quality standards in all aspects. Is to manage, create, provide and maintain comprehensive infrastructure of international quality standards necessary for the promotion and installation of industries with proper planning, efficient performance, and competitive development within an area specifically designed and planned for it, ensuring ownership and private investment as drivers of economic and social development of the community. It is the only place where power is delivered directly from USA. Residential land within the park boundaries. Young workforce is constantly growing. Yuma Arizona: an attractive sister city in the USA.